Greetings from Oslo on the most important day of the year here. Syttende mai, which means 17th of May, is Constitution Day. Norway is officially 202 years old today. This is a day that is hard for Americans to grasp unless they can actually experience it themselves. America has its cookouts and fireworks, while Norway has its parades and national costumes. Every citizen in the city is out in their finest, flags are waving, the parade through town contains kids representing every school in the municipality, and massive amounts of ice cream is consumed. What a welcome to Oslo on our second day in the country. The majority of us left Knoxville early on the 15th, sustained a ridiculous layover in Newark with a trip into NYC, and flew out that evening arriving in Oslo on the morning of the 16th. Everyone was able to get settled into the dorm and have the rest of the afternoon to nap before their Norwegian dorm mates showed them a warm welcome that lasted well into the night. Waking up in a Norwegian dorm on the morning of the national holiday meant being greeted by musical instruments down the hall at 7am, witnessing the judge and jury ceremony in the quad, and experiencing the finest breakfast of the year. This was followed by going into the city where we found ourselves amongst thousands of Norwegians celebrating their national holiday. The University of Oslo (UiO) provided the entire group with passes to join in festivities being sponsored by the university inside the UiO Law library in the city center. This provided us a respite from the crowds, light sustenance and most importantly, bathrooms. 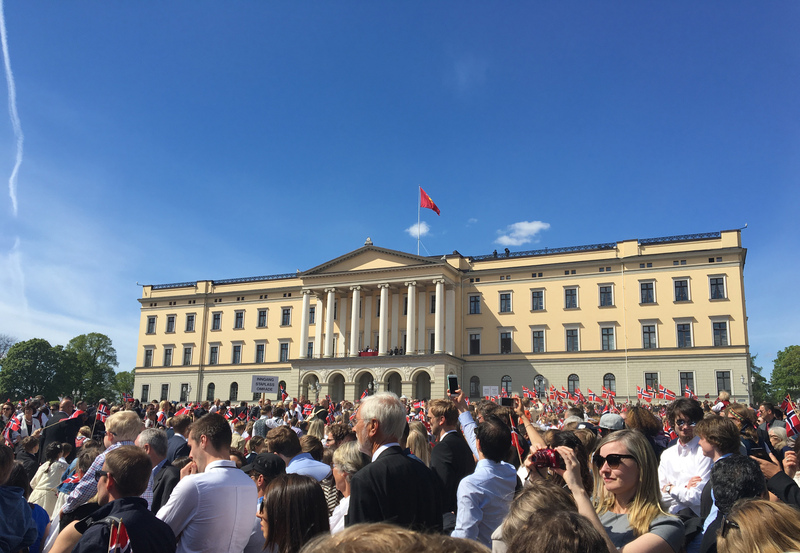 As part of the parade through the town, the school groups all stop at the Norwegian Royal Palace, Slottet, and bow their flags to the royal family. We edged our way as close up to the building as possible in order to catch a glimpse of this activity and of course attempt photos with the monarchy in the background. It was a beautiful, if not exhausting, day and everyone got a strong sense of the pride Norwegians have for their national identity.